We’re thrilled to introduce the timeless elegance of a simple border to the crisp White Comphy bed. These Grey Border Linens work beautifully with both contemporary and traditional interiors, and feature a wide border in classic Grey on White. 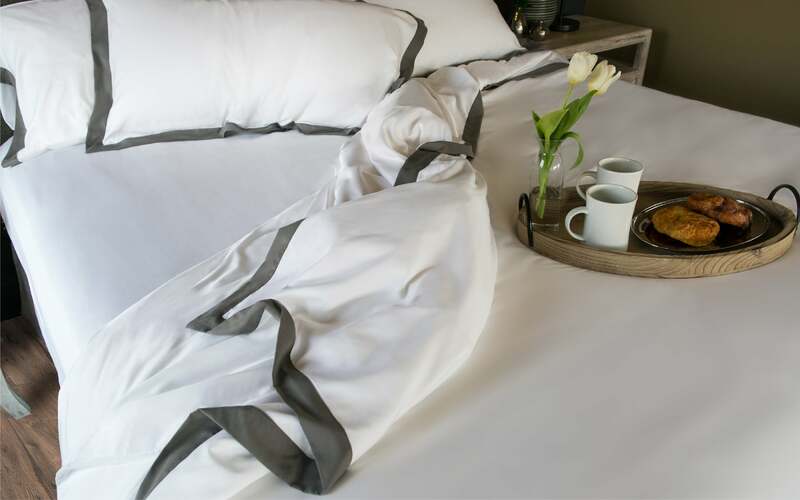 Our bordered items include a Duvet Cover, Sheet Set, Pillow Case Set, and Pillow Shams. Each item can be purchased separately, or all together to create a seamlessly stunning look. Flat sheet features a border at the top, designed to be visible when turned down (as pictured). Fitted sheet comes without a border. Twin, Twin XL, and Full Fitted sheets are 15" deep. Queen, King, and Cal King Fitted sheets are 18" deep. Split King Sheet Set, a set of Comphy sheets that includes two Twin XL fitted sheets, one King flat sheet, and two King pillow cases.